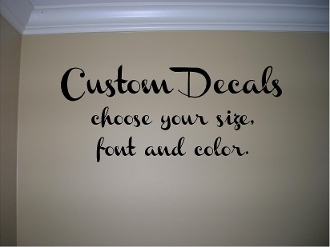 Choose your wording, color, font (go to dafont.com) and size. Leave me the information of what you want when you check out or you can call me with the information. If you would like it in a different size, email me. Goes onto the wall or flat surface in minutes and will look like it has been painted on. When you are ready for a new look simply heat them up with a blow dryer and they peel right off without leaving a sticky residue or damaging the wall.